Our inspiration for this week was the word music. This was slightly difficult for me as my fibro is such that listening to music has gotten painful. If there is one thing that I hate about this disease it has to be that. I always used to have the music playing wherever I happened to be. So I was obviously going to have to think outside the box for this theme so I started to consider other sounds that are music to my ears. The sound that stood out the most is the sound of the waves at the ocean. When I need to recharge I can't usually make to the actual ocean but we have a lot of bays and inlets here in Washington that have waves. 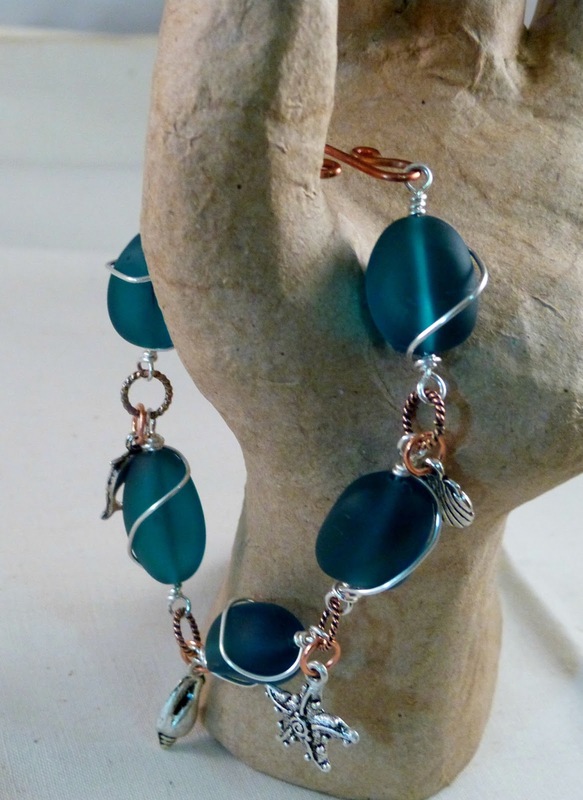 Seaside Harmonies was made using sea glass and pewter charms. The findings are copper because I love to mix metal and the wirewrapping is done in German Silver. This bracelet is actually for sale for $20.00 + $3.00 for domestic shipping.